What a perfect start for us at HotSauceDaily to begin a review of Ed’s Roadhouse Jerky with their “Sriracha Chili with a Wasabi Twist” flavor. We opened the pouch not expecting much of an authentic taste. After all, how do you marry jerky AND Sriracha sauce AND wasabi all in one meat? But within 2 bites we were blown away. After 4 bites, we were ready to just eat the whole package – savoring the wonderful flavors and heat levels. The very nature of making flavored jerky of this fashion certainly leads to some uneven flavors among the pieces. But that does not mean uneven quality or taste; simply that some pieces have more horseradish, some more wasabi, some more jalapeño heat. There is even a strong black pepper taste on some of the pieces. Texture & Appearance: – Thin cut bite sized pieces about 1 – 2 inches long. Consistent color, with variable grain. Specks of spices and some small pepper seeds adhere to some of the pieces. Very few pieces had any visible fat. Shape, cut, and sizes are all about even. Taste Straight Up: – After some extensive sampling and testing (i.e. eating half of the bag right away) we grew to enjoy the many different flavors and heat levels that each piece would bring. Like a dysfunctional family (and we mean that lovingly), some pieces were hotter than others, some spicier with more of the wasabi flavor, some were sweet from the sugar and molasses, and some had a tinge of a vinegar zing with a good dose of fresh black pepper. Heat Level: – Our heat rating is low for a few reasons, and this is not a bad thing, just suffice it to say you’ll enjoy this jerky for its flavor, but not for the heat. Consistent with the inconsistency, some pieces were ‘hotter’ than others, some spicier – some had more wasabi or black pepper, or jalapeño heat, or were more sweet… well you get the picture. Let me repeat, this “all over the map” flavor by pieces was not undesirable by any means. If anything, it added to the “homemade” taste and quality that makes for a great hand-crafted product. Label/Graphics: – We give the label and graphics a high mark for simplicity. It’s jerky. In a pouch. The label is small enough so that you can easily see the product inside the pouch. The ingredients are clearly listed, the title and flavor are bold, and when you add their slogan “Nobody Beats My Meat”, well, how do you top that? Kudos for a classy, simple package. Overall Rating (Final Thoughts): Having published HotSauceDaily.com since 2007, this is our first jerky review. 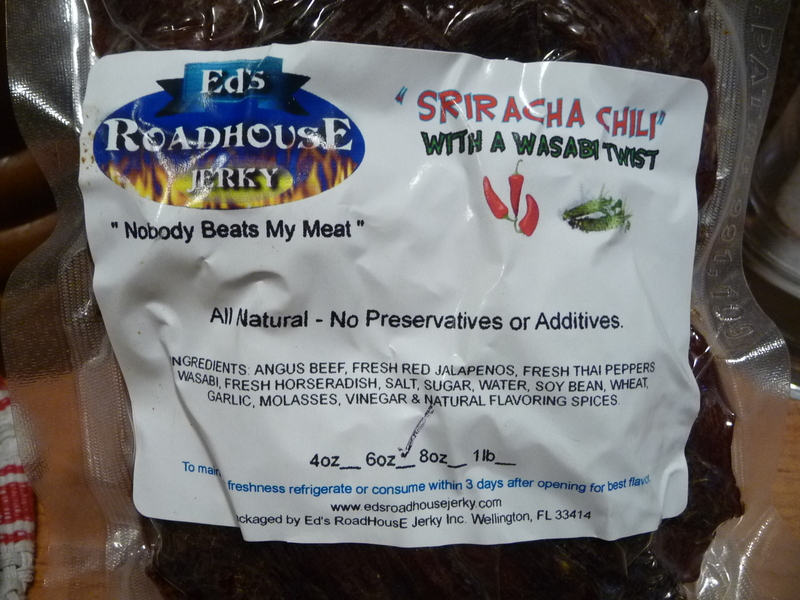 So while we are no experts by any means, we know what we like, and have to award Ed’s Roadhouse Jerky – Sriracha Chili with a Wasabi Twist – our highest overall rating of – based on overall flavor and enjoyment. We would like to have had more of the Sriracha and Wasabi flavors stand out. You know, in a burn the back of your nasal passages kind of way, but that would probably be overkill and take away from the enjoyment of this flavorful jerky. Maybe Ed knows what he’s doing after all. Ed’s Roadhouse Jerky – Sriracha Chili with a Wasabi Twist – like all of their flavors of jerky, is available in 4, 6 and 8 ounce pouches, as well as 1 pound packages. Visit EdsRoadhouseJerky.com to see the other 30+ flavor offerings and for your jerky shopping fix. And tell him HotSauceDaily sent you! This jerky is made fresh to order, so you know you’re going to get the best possible product. I love the fact that there are no preservatives or additives. In fact,they recommend you refrigerate the jerky 3 days after opening it (if you have any left, which is highly doubtful). I’m not exaggerating when I say this stuff is addictive. The meat is more tender than any other jerky I’ve had, without the bits of nasty gristle that you find in most dried meat products. No question about it, this is the best jerky I’ve ever had! Just the idea of the wasabi, horseradish, and sriracha all together makes my sinuses whimper, lol. 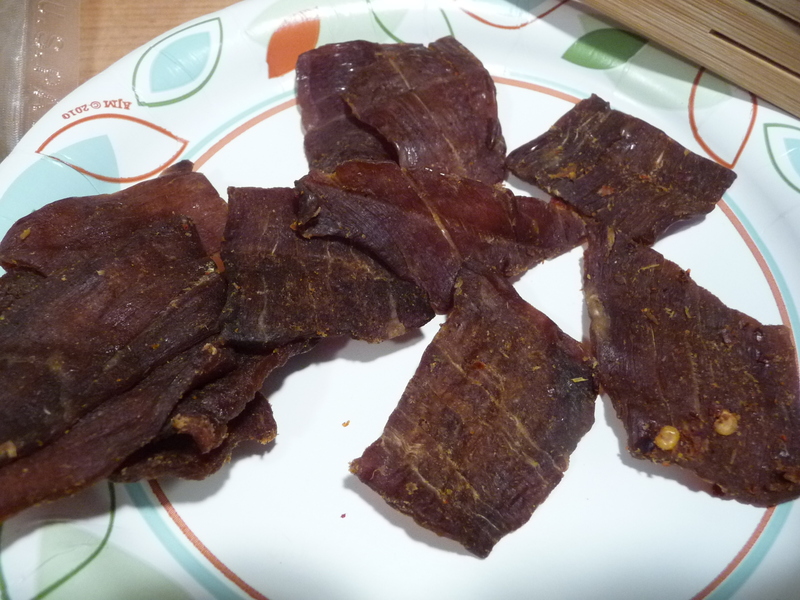 Considering all the ingredients, Chris, this jerky is remarkably tame, yet flavorful. We plan to order more flavors of the jerky, as it’s some of the best we’ve ever had. Thanks so much for the review Brian. This jerky was not intended to be an extremely hot jerky. It was made so you could taste the flavors and enjoy each of the components. We have some flavors that are extreme with heat yet you will always be able to enjoy the flavor it is suppose to represent. Ed has the talent and the passion that come through in each of the recipes he creates. Looking forward to the reviews on the hot sauce that we sent. P.S. Ed just created a new fantastic hot sauce that we will be sending you .